Iron Dome shoots down two Gaza rockets that were headed towards Ashkelon, hours after attack on Sderot. 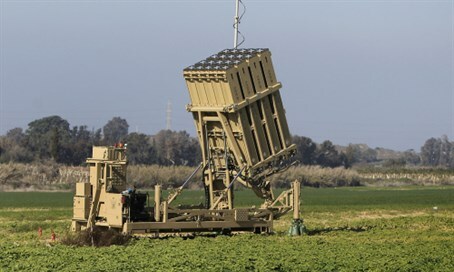 The Iron Dome anti-missile system on Friday night intercepted and shot down two rockets fired from Gaza that were headed towards the city of Ashkelon. Sirens sounded in the area at approximately 11:30 p.m. local time, forcing locals to temporarily retreat to bomb shelters. There were no reports of physical injuries. The rocket attack on Ashkelon took place some two hours after a rocket attack from Gaza on the city of Sderot. The rocket landed near a home in the city, causing damage to the building and to a parked bus. There were no physical injuries in the Sderot attack, but several people were treated for shock. Yisrael Beytenu chairman MK Avigdor Liberman placed the blame on Prime Minister Binyamin Netanyahu for the Sderot attack. “There is no deterrence against terror in Jerusalem, there is no deterrence against the rockets from Gaza, there is no security for Israelis, there is no Prime Minister in Israel!” he wrote on Facebook. Friday’s rocket attacks are the latest in a series of rocket attacks from Gaza, though quite a few of them have missed the mark and actually landed in Gazan territory. In one incident two weeks ago, Palestinian Authority-based media reported that one rocket exploded in the vicinity of a Gaza home, causing casualties.